People boasts caring about Environment either working in the prestigious organization or as an individual in new thematic areas like climate change. Today, I would also like to stand in line among them right in front of the World that “I’m GREEN TRAVELER”. Since I also work in the non-profit organization and conducted several programs, projects, talks on climate change, presentations and also believe that i have been able to continue to convince my audience that insufficient “Care to Environment” is an essential environmental problems of today and future for the overall sustainable development. I felt like am i missing something? In my presentation, I used to mention that unless every individual initiates to really care about Environment, always a big corporation may not always be that efficient. So, i imagined on how to work on, actually on a practical scale for the Environmental stewardship. Few years ago, i met a very good friend, volunteering in my organization in Nepal, Mr. Paul Ostrowski, from America, who used to ride a bicycle to office everyday. During this time, I was busy trying to develop a scope by bringing an awareness on Aviation sector into Green Travel and Green Economy, where entrepreneurs could neutralize Green house gases (GHGs) emitted from their airplanes. With my colleagues, I even calculated GHGs and researched paper has been given for publication in Journal paper. It was also great to notice more on the GHGs production when my mother as an individual could produce when traveling from Nepal to Australia -Hongkong – Nepal, calculated by ICAO (International Civil Aviation Organization). Recently, due to financial crisis, I’ve sold my motorcycle in cheap and started to ride on taxi everyday from home to office and back, which is more expensive. With my friend- Paul, we interchanged information on Caring environment and importance of bicycle on environmental and personal health perspective. 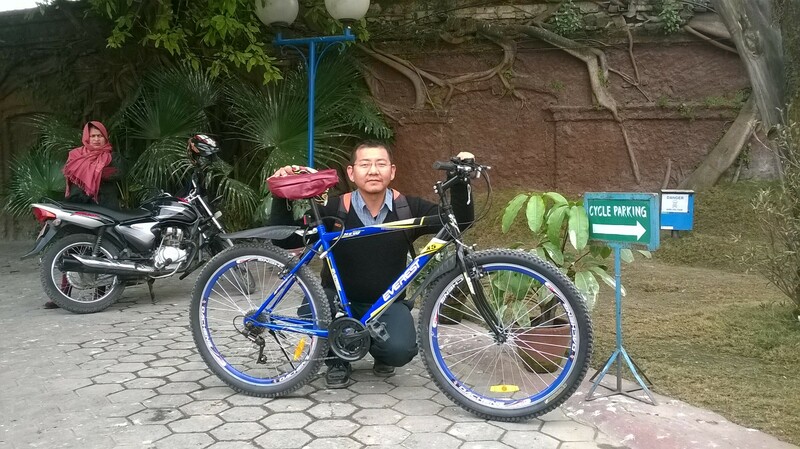 However, I took sometime, but, on Februrary 03, 2015, i bought a bi-cycle and riding it everyday. I’m so glad that now I’m a GREEN TRAVELER and trying my best in helping the World in reducing production of GHGs from my your part. I am also going to stick a sticker message on my bicycle-“I’m GREEN TRAVELER / Travel Green”. I have a vision that People use bicycle to travel for their office/leisure/school which are in nearby for clean environment. So, I strongly recommend people should be traveling in “Bicycle Everyday” if destination is in short-distances in city places. Will you join this “Bicycle Everyday” Revolution? Do anybody care?